With a population of 194,636, Ponce is Puerto Rico's second largest city (San juan is the first and Mayaguez is the third). Ponce is commonly known by several names: La Perla del Sur (Pearl of the South), La Ciudad de los Leones (City of Lions), or La Ciudad de las Quenepas (Genip City). Ponce is also known as the "Ciudad Señorial" (Majestic or Noble City), because of its many beautiful neoclassical buildings and facades. Nearly one half a billion dollars have been spent preserving the colonial core of Ponce. 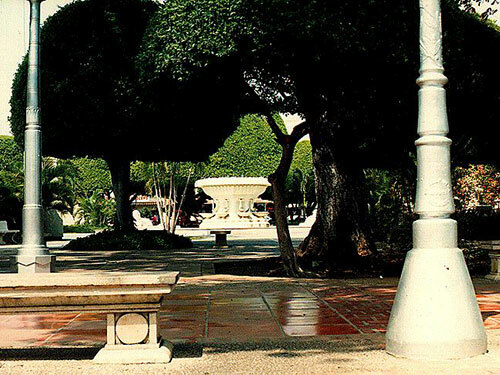 The heart of Ponce dates from the late 17th century and has been declared a national treasure. It consists of plazas and churches and highly decorative colonial homes, some glorious fountains and a unique fire station. 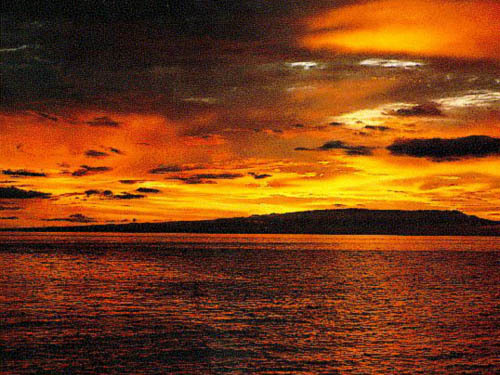 Ponce is an important trading and distribution center, and has a port of entry; Playa de Ponce Port is one of the busiest ports in the Caribbean area, handles tobacco, coffee, rum, and sugar cane. The beautiful downtown Plaza de las Delicias is a worthwhile stop, with lovely fountains, a cathedral and local bench sitting denizens. The unique red and black, century old wooden firehouse, commonly known as Parque de Bombas is a landmark and still in use. Parque de Bombas originally built in 1882 for an exposition and from 1883 to 1989 it served as headquarters of the Ponce Fire Corps. In 1990, the firehouse was reopened as a museum, there are exhibits on the second floor, and the municipal band plays a free concert every Sunday night. La Guancha Paseo Tablado, the boardwalk, is a fun stop where you can loiter with lively local Ponceños-the teen scene, elders and the toddler-mamma set. The pier here is the departure point for a regularly scheduled weekend ferry to Caja de Muertos (Coffin Island or Dead Box Island), a small island of pristine beaches, an old lighthouse (built in 1887) and a marked snorkel trail (under construction). Ferry services: Saturday, Sunday and holidays from 9am and return to 5pm. 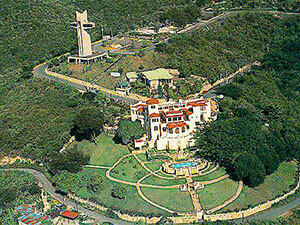 Castillo Serralles (Serralles Castle) located near to El Vigia Hill, is a lovely landscaped former residence of the most powerful rum-producing families, the Serralles family, producers of Don Q rum. The Serralles Castle is a magnificent example of Spanish Revival architecture, popular in the 1920's; indoor patio with fountains, beautiful formal gardens paralleling the style of the house, well-manicured flame of jungle plants growing in a pattern that matches the ironwork on the house. It was designed by architect Pedro de Castro and was completed in the early 1930's. Open Thu-Sun 9:30am-5:30pm, admissions $3.00, children $1.50, groups must reserve in advance, (787) 259-1774. Rivers: San Patricio, Cerrillos, Chiquitos, Inabon, Pastillo, Canañas, Bucana, and Portugués. Annual precipitation is approximately 37 inches and the average temperature is 79 F. Precipitation is the lowest in February, with an average of 1 inch. Most precipitation falls in October, with an average of 6 inches. August is the hottest month of the year. The flag consist of a rectangular cloth divided by a diagonal line, creating two equal isosceles triangles, starting from the top left hand corner and ending on the lower right hand corner. The top triangle is red; the bottom triangle is black. In the center of the flag sits the shield of the municipality. Under this shield is the number 1877, the year of the founding of the city, and above the shield is the word Ponce. The coat of arms of the municipality is based on the design of the official mayoral seal that was adopted in 1844 under the administration of mayor Salvador de Vives. The coat of arms of Ponce consists of a escutcheon (shield) in the Spanish tradition. This shield has a field with a party per bend division. The division runs from top left to bottom right. The field is read and black, bordered with a fine golden line. In the center of the shield is the figure of an erect lion standing on a bridge. The top of the bridge is a golden, the middle is red bricks, and the base foundation is gray rocks. Under the bridge there are gray wavy lines. Over the shield rests a five-tower golden stone wall with openings in the form of red windows. To the left of the shield is a coffee tree branch with its fruit, and to the right of the shield is a sugar cane stalk. The symbols of the shield are as follows: The field represents the flag of the municipality of Ponce, divided diagonally in the traditional city colors: red and black. The lion over the bridge alludes to the last name of the conqueror and first governor of Puerto Rico, Juan Ponce de Leon. The waves under the bridge allude to the Rio Portugues, on the banks of which the city was born. The coronet in the form of a five-tower mural crown above the shield allude to the Spanish crown, through which the settlement obtained its city charter. The coffee tree branch and the sugar cane stalk represent the main agricultural basis of the economy of the young municipality. Want to know what to see and do in Ponce? Discover few ideas for exploring and enjoying the city. The Teatro La Perla in Ponce holds an annual theater festival in honor of Luis Torres Nadal. The festival features productions by local theater companies and musicians. Tickets $10-$11. Ponce celebrates every year the famous "Feria Artesenal". the celebration includes dance, music, food and exhibits by artisans from several cities of the island. Every year, Ponce celebrates a patron saint festival. The festivities include dances, food, parades and religious processions. There are 77 public schools in Ponce, education is handled by the Puerto Rico Department of Education. Ponce is also home of 14 colleges and universities.